“Many veterans are hesitant to try meditation and mindfulness because of societal stereotypes it carries in our community. In my practice, however, I’ve found meditation, mindfulness and voice therapy to be highly effective in reducing stress, refining focus and raising optimism. Bravo Tango Brain Training is a bridge to seeking help and brings a unique approach directly to the veteran community where we feel safest: our homes,” says Dr. Valdovinos. In producing their scripted series, The Long Road Home, based on Martha Raddatz’s New York Times best-selling book that chronicles the lives of service members and their families through deployment and post-deployment, National Geographic gained deep insights into the home life of veterans, ultimately realizing there was an opportunity to expand the impact of their stories. Inspired by the real-life veterans portrayed in the series, National Geographic along with 360i wanted to go a step further and do something to not only enhance mental health support for veterans and reduce barriers to seeking treatment but also bring renewed attention to important veterans’ issues. As part of launching the series, the network has also partnered with numerous veteran’s organizations including the Bob Woodruff Foundation, Team Rubicon, Blue Star Families, The Mission Continues,Veterans of Foreign Wars, Global War on Terror Memorial Foundation, and the USO. Bravo Tango Brain Training is free and now available on all smart phones and voice-powered devices with Google Assistant. 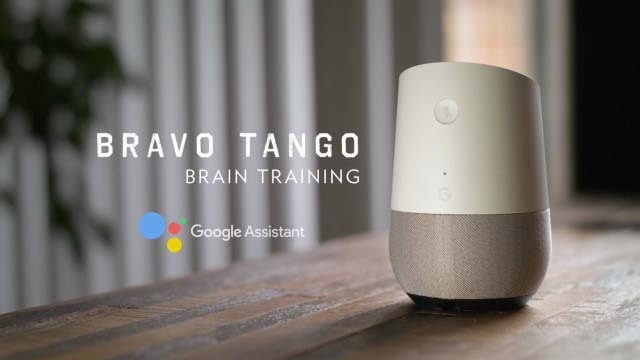 To use, open the Google Assistant app, and say “Ok Google, talk to Bravo Tango.” The program will then guide the user to an appropriate exercise based on how they’re feeling. Bravo Tango recognizes over 40 moods, including anger, loneliness, anxiety, disappointment, regret, sadness, fatigue, fear and insomnia. Exercises range from breathing, and focus, to grounding and visualization, even interpersonal connection and muscle relaxation. While Bravo Tango Brain Training is an effective and accessible method for reducing stress and anxiety, it should not be used as a replacement for ongoing professional care. For more information, please reference the Terms & Conditions. Click here for the official Bravo Tango press kit, including photos and video assets. No soldier fights alone. Based on the New York Times best-selling book by internationally acclaimed journalist Martha Raddatz, The Long Road Home tells the story of “Black Sunday,” when a small platoon of soldiers from the 1st Cavalry Division was ferociously ambushed in Sadr City, Baghdad, in April 2004. Eight Americans would make the ultimate sacrifice that day, and more than 65 would be seriously wounded. The global miniseries event airs Tuesdays at 9/8c on National Geographic and offers viewers a gripping and intimate look at the toll war takes on soldiers and their families. The adrenaline-fueled and deeply emotional journey follows the action on two fronts: the chaotic and terror-filled streets of Sadr City and the home front at Fort Hood, where family members desperately await news of their loved ones. The Long Road Home ensemble cast includes Michael Kelly, Jason Ritter, Kate Bosworth, Sarah Wayne Callies, Noel Fisher and Jeremy Sisto. National Geographic Partners LLC (NGP), a joint venture between National Geographic and 21st Century Fox, is committed to bringing the world premium science, adventure and exploration content across an unrivaled portfolio of media assets. NGP combines the global National Geographic television channels (National Geographic Channel, Nat Geo WILD, Nat Geo MUNDO, Nat Geo PEOPLE) with National Geographic’s media and consumer-oriented assets, including National Geographic magazines; National Geographic studios; related digital and social media platforms; books; maps; children’s media; and ancillary activities that include travel, global experiences and events, archival sales, licensing and e-commerce businesses. Furthering knowledge and understanding of our world has been the core purpose of National Geographic for 129 years, and now we are committed to going deeper, pushing boundaries, going further for our consumers … and reaching over 730 million people around the world in 172 countries and 43 languages every month as we do it. NGP returns 27 percent of our proceeds to the nonprofit National Geographic Society to fund work in the areas of science, exploration, conservation and education. For more information visit natgeowild.com or nationalgeographic.com, or find us on Facebook, Twitter, Instagram, Google+, YouTube, LinkedIn and Pinterest.